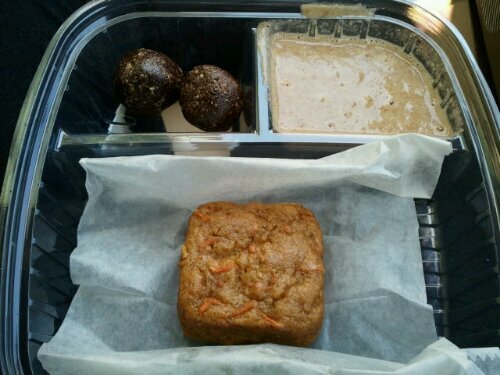 Zenergy Food Truck – South Fl’s Raw Vegan Food Truck! One day a couple of months ago, I was coming out of yoga, and much to my surprise, there was a raw, vegan food truck setup in the parking lot! I was far too deep in post yoga mode to consider eating anything, but took a business card and then began tracking their whereabouts on twitter. They tend to hang out a lot in the Fort Lauderdale area, which really works out for me. I finally got to meet up with them about a month ago, before running up to Wellington to go meet some sphynx and devon rex kitties. This particular day they were parked in front of the Merriwheather Resort (by the Ritz) on A1A, south of Sunrise. They could not have been more awesome, and saved us a breakfast zento box to try, as well as gave us some “Happy Hippy” (contains bee pollen!) smoothies to start our day off right. Above, I forget what they were called (power balls? ), but they were yum, cream of flax (which had a lot of cinnamon, so I fed it to Thomas. I think too much cinnamon gives me a headache? ), and a baked mini carrot cake. Our nice green, spirulina filled smoothies that matched our shirts. Yes, Thomas and I have a habit of matching without meaning to. A few weeks ago, I picked up 3 Zento dinner boxes for Thomas, Bobby & I, and decided to throw it into one post so you could get an idea of what they offer. She tossed in a bag of yummy kale chips for us too. Although it may seem like Zenergy uses lots of plastic, they actually use plant based, compostable containers, as they have a deep interest in health and well being. You can read all about them and their moving story at zenergytruck.com. 1. Happy Birthday! 2. I must track these folks down. 3. Thanks for the heads-up.